It has become a statement acknowledged as fact: Recruiting is paramount to an effective team. As such, you might not like what I have to say. But when I look at the college level of the sport as a whole, I see the hype of recruiting, National Signing Day and related hoopla overblown in terms of significance. We are talking about teenagers in high school deciding where they want to attend college and HOPEFULLY play football. As I have asked some of my friends, “How much of your life savings would you bet on (insert name of player) making it to the NFL and becoming a superstar?” None of them has yet to place a bet that I know of! You never read, much like the NFL draft, how recruiting in college football is a “slam dunk” or “an exact science.” Instead, phrases like “educated guesswork” are more common. Yet often fans treat the players like they have years and years of experience behind their backs. In its lead-up issue to the recent playoffs, Sports Illustrated noted Alabama, Florida State and Ohio State as having 10, nine and five five-star-rated players on their teams. 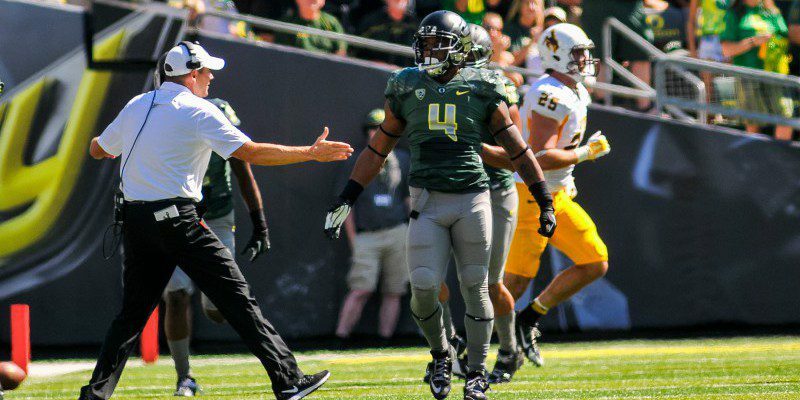 Oregon had one — Thomas Tyner. Interestingly, the two teams with the most “five-star” players both lost in the semifinals. Thomas Tyner running against Michigan State in 2014. As we know, it was not him because he never played a down for the Ducks. On the flip side, Kenjon Barner was a three-star recruit who began his career in the defensive backfield on Oregon’s scout team. He finished his career as the #2 rusher in Oregon football history! I am quite certain he was not recruited under the promise of, “If you come to Oregon, you will leave as one of the most prolific running backs ever to play for the Ducks.” As well, how many Oregon fans would have predicted his outcome when he signed on to Oregon? 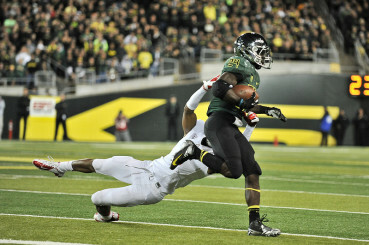 Kenjon Barner rushing against University of Arizona in 2012. Recruiting is about helping teenagers make a decision, and once they have made that decision then providing them with the tools, resources and structure to be successful both on and off the football field. Oregon does not just want recruits. Instead, among many qualities the coaches want, they want young men who are willing to work hard, are respectful and mindful of the team’s needs, are good students, and dedicated. Thus it comes down to one key ingredient over and over … COACHING! A team can have access to great facilities and bring in plenty of talent, but it all begins, continues and ends with coaching. It takes coaches to pursue recruits whom they believe will help the football program. It takes coaches to orchestrate, conduct and lead practices upon practices. It takes coaches to create game plans and manage the games themselves. It takes coaches to put players in positions to be successful. It takes coaches to “reconstruct” a team after a season has ended and some of the team has departed. The list goes on and on. There is an excellent article which appeared in FishDuck.com a few years ago on how many “stars” were given to some Oregon recruits who finished their careers at much more successful levels than perhaps many imagined possible. This again illustrates the dual nature of college football success. Talent may be there, but unleashing that talent is even more crucial. GO DUCKS!